It's a little late for September's entry into Year of the Cupcake, but only by a day, and I think that's okay. I would have made them last night, but went to see Crazy, Stupid Love with my BFF Ness instead. Seemed to make more sense to kick back and relax after a long week, rather than stay up all night baking. Plus, the people I promised cupcakes to come Monday will appreciate them being fresher. PS - Ryan Gosling does indeed appear to be photoshopped as the ads for Crazy, Stupid Love would have you believe, in a tasty way. He's probably a little bit to tidy-looking and skinny (= too intimidating to get n@ked with) for my liking (I'm not a fan of being able to see veins on stomachs) and also a little bit too spray-tanned (probably deliberate, given the nature of his character), but it didn't stop my tongue from falling out of my mouth when he took his shirt off. Sorry if that makes any of my male readers squirm but it's true. And he does have yummy arms, which makes me forgive the icky veins on his stomach. Aaaaaaaanyway, you know how I lack the ability to actually follow a recipe? Even if it's reputed to be the perfect recipe? Well, I did it again. Yes Siree-Bob, I tried to stick to a perfectly good recipe - in fact, the ultimate vanilla cupcake recipe, perfected through many trials by the lovely Stef (and 50 test cooks) who brings us Cupcakeproject.com, the site that ran the icecream cupcake contest earlier in the year - but the fact that I've been known to make decisions based on cost (for example, I already have a similar ingredient - like milk or sour cream - at home and am not willing to purchase, say, the full-fat version of it until I have used up what I have), and also based on the audience (eg. every time I bake at mum's, which is most of the time these days, she begs me to make it gluten free so that she can partake), meant that I once again failed to follow a recipe. This seemed particularly outrageous today, given that it is the ultimate vanilla cupcake. By the way, I'm not taking the piss. I actually can see why this could be described as the ultimate vanilla cupcake. I only made the gluten free version of it, which, let's face it, is never anywhere near as tasty, and it was fan-bloody-tastic. Every time I eat one (three so far and counting! *burps*) I roll my eyes back in pleasure as I get a whiff of the vanilla-ey goodness. If you want your cupcake to actually be light and fluffy and taste like vanilla, this is the one. It's not a butter cake and it's not a sponge and it's kind of made a little bit backwards, but *drools*... okay, I'll get to the recipe so you can try it for yourself! Note that I'm copying out Cupcakeproject.com's recipe and annotating in brackets what I changed. If you want it with less mess, just click on the link above and that will take you straight to the original recipe. First up, scrape seeds out of vanilla bean (or in my case, scoop 1tsp of vanilla bean paste out the jar) and mix through the sugar until it's all evenly distributed throughout the sugar and there are no clumps. Place flour, baking powder, OH CRAP I MISSED AN INGREDIENT WHEN I MADE THEM!!! *scrolls up and corrects ingredients list*, baking soda and salt into a mixer bowl and combine. Add sugar mixture and mix until well combined (I just had the Kenwood on low the whole time, and kept it on low as I added and mixed all the bits and pieces). Add the butter. The mixture will resemble fine breadcrumbs. While the butter is mixing in, in a small bowl combine eggs, sour cream, canola oil and vanilla. Mix until smooth (I used a small whisk which seemed to work. I also used the bowl the sugar was originally in to save more washing up). Add to the dry ingredients and mix until just combined. Then add milk, a little at a time, until just combined. I stopped the mixer the second this had happened and gave it a scrape down, and then mixed for about another 5-10 seconds. At this point the batter will be quite runny but don't let that freak you out. Fill 16 wrappers half full and bake at 175oC for 14 minutes (I filled 18 wrappers half full and my cupcakes were probably a little bit small. I guess my perception of half full was out of whack but I didn't want them to spew over the tops and go all over the place. It is also possible that an Australian cupcake wrapper is slightly smaller than an American one. I baked the first 6 or so minutes at 190oC (apparently this helps GF products rise) and then turned it down to 175. I also forgot to look at the clock when I began so I'm guessing a little bit here, but I baked them for closer to 16 or 18 minutes after checking at 14 minutes. The ones on the little tray took a couple of minutes longer still, and I have reached the conclusion that the seals on mum's oven door are totally buggered, and that the hot spots and cold spots are far hotter and colder than they ever were before!). Check with a toothpick - it should come out without wet batter on it. If you want to pipe really retarded bees like me, go right ahead. They're definitely kind of cute, but, as I said, also kind of retarded. I blame it mostly on the fact that I was using mum's old piping set with its fat, inaccurate tips and not my beautiful new one with the fine tips (one of the many things I miss about life in Adelaide). I also don't have wikkid piping skillz (although I am improving - makes you wonder just how bad I was before! - and also just remembered that I have photos in my camera of some piping practice I did which I haven't posted yet). You can also decorate them with flowers, which, like a lot of things I make, look kind of impressive but aren't. I'll tell you how I made them below. I just made the most simple icing possible - icing sugar and boiling water with whatever food colouring you want. I didn't even bother sifting the flour. THAT'S how lazy I be gettin'. I iced 2/3 with a green background and the remaining 1/3 with a blue background. For the background you want the icing to be a bit softer but not stupidly wet. You want a bit of thickness about it, not just a glaze, but you don't want it too thick otherwise it'll rip the top off your cupcake as you spread it, and you'll end up with too much icing on it. I'm sorry I didn't measure it but it's just too hard. Figure it yourself, dawg, a'ight? These are my bees. The icing for the bee was a bit thicker than that of the base, so that it wouldn't run. I kind of did a yellow oval with a round bit stuck to it and filled them in, and then overlayed the black stuff. You need a fair bit of colouring to make it properly black. Don't be gettin' it on your hands. That's why I luvz the Americolor squeeze bottles. Also, when you squeeze, hold it totally upside-down. If you hold it a little bit sideways you'll get it all over the top of the bottle which sort of defeats the purpose of the squeeze bottle. As for the flowers, well, I reckon I knew how to make these before I could walk, and I'm actually not exaggerating by much there. 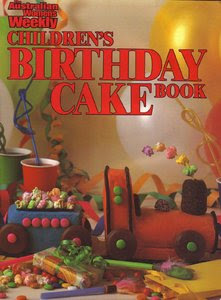 You know the AWW birthday cake cookbook that EVERYONE's mum had back in the eighties? You know, this one? Well, as a little tacker ﻿I used to spend hours and hours reading it, deciding which birthday cake I would have for my birthday that year. You see, mum would let us choose one and would make it for us. If you flip through her copy of the book the cakes we had have our name and our age written at the top of the page, up until about the age of eight or nine. Maybe that's where I get my love for baking from and also my desire to challenge myself and decorate outside of my comfort zone (hah! And, in the case of these bees, not do a great job... but hey, I tried, right?). Anyway, somewhere near the front of it there are instructions on how to make flowers out of marshmallows. Basically, you cut a marshmallow in half horizontally with a pair of (clean!) scissors, dip each half in jelly crystals, then cut each half horizontally in half again, and dip each of the sticky sides in jelly crystals again. You end up with four pieces per marshmallow. White marshmallows give you the best results because the colour stands out better. Squeeze the ends together to make a petal shape. Also, I tinted sugar with liquid colour instead of using jelly crystals because I wanted two colours and didn't want to waste most of two packets of jelly crystals (knowing that I wasn't about to make jelly). These days, the AWW have put out a more modern version of the book but I prefer the old one - the new one is a bit heavy on the use of sugar paste/fondant and are a little bit complex for your average working mum, and I think that kid's cakes should be more about buttercream frosting and be able to be whipped up the night before after work rather than having to get up at 4am to decorate the damned thing. Kids like colours and they like sugar and they don't give a hoot if you spent an hour tinting and rolling out fondant, or five minutes mixing up a buttercream and slapping it on. I also think that people who spend hundreds of dollars on a fancy bought cake for their kid's birthday should be shot. It's one thing to bake a fancy one if you're into cake decorating, but if you're not and you want to fake it, well don't. Nobody will be impressed, and most people will feel sorry that you didn't have time to make your kid a cake, or, better yet, make the cake WITH your kid like our mum used to do for us after she got home from work. Sure, some people have challenging family or health situations that genuinely do eat up their time and energy, but most people who buy fancy cakes for their kids don't fall into that category. Pull your finger out and buy a packet mix (or, if you're THAT busy, most supermakets stock ready-made plain buttercakes of various shapes and sizes) and some lollies to decorate it. Rant over! Anyway, this link goes through the process a bit more thoroughly than I did above with the modern version of the original cake that I learnt the instructions from. Oh, and I made the petals first so that I could stick them on while the icing was still wet. I then dipped the m side of an M&M (hah! Here's an old one: Q - Why did the blonde get fired from the M&M factory? A - Cos she kept throwing out the W's) and "glued" it into the middle of the petal.